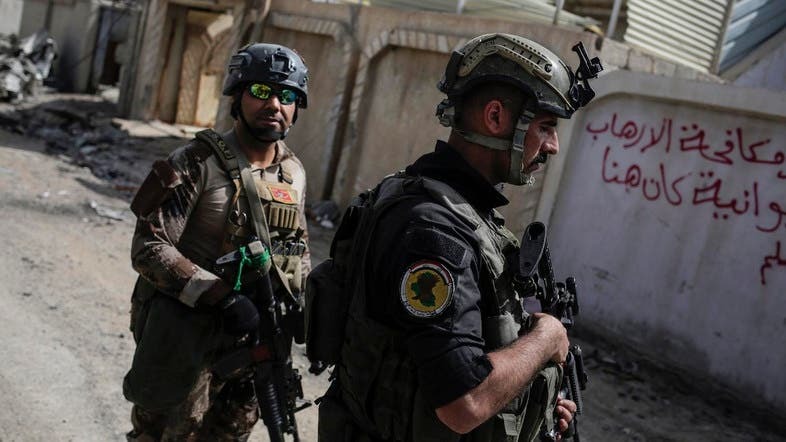 The commander of the second operations in the counterterrorism agency, Major General Maan al-Saadi, announced on Wednesday that his forces liberated the neighborhood of al-Maamel in the heart of the right coast of Mosul. Al-Saadi said in a statement to Al Arabiya that his forces liberated al-Maamel neighborhood Wednesday after freeing the industrial zone yesterday. The forces are now surrounding the agricultural reform district in preparation for entering in the coming hours and then liberate it. For his part, the commander of the forces of the Iraqi counter-terrorism unit, Lieutenant General Abdul Ghani al-Asadi announced the death of an ISIS leader during the battles over al-Maamel district in Mosul. Al-Asadi told Al Arabiya that the terrorist Abu Ayyub al-Shami and three of his companions were killed during the battles in the al-Maamel neighborhood.